For Christopher Nolan’s latest creation, the well-received (with audiences and critics alike) mind-bender Inception, he knew who to turn to in order to design the perfect aural landscape for the various levels of his film’s world. Nolan and Zimmer worked together previously on Batman Begins andÂ The Dark Knight, both of which had impeccable composition. For Inception, Zimmer takes some of the dark, brooding elements that were found in both of the Batman films and overlays a bit of subtly creeping emotionality. Throughout the course of the film, it’s hard to separate Zimmer’s score from the action. The world that Nolan has created visually seems to be synced up perfectly with Zimmer’s ever-present musical backdrop. Tracks like “Old Souls” capture the seemingly opposing ties between true emotional connections and a sometimes threatening dreamworld set. Though it’s the twisting storyline that has audiences talking long after the film has ended, it’s the best moments from Zimmer’s score that truly highlight the emotional ties between characters (the nine-minute “Waiting For A Train” is equally heartbreaking on the screen and on its own) and heighten the action sequences to a heart-pounding intensity (check out the energetic track “Mombasa” for a perfect example – this is part score/part club remix). But it’s no surprise that Hans Zimmer has crafted a masterful score. With over 100 scores and seven Oscar nominations (one win) under his belt, it’s fair to say that he knows what he’s doing. Although I typically see a movie before reviewing a score anyway, it’s not always necessary to enjoy a good piece of composition. In this case, I would say that seeing the movie is a bit more important because each piece is specifically tied in to a scene or plot-point in the movie. Although the music is still nice to listen to without that information, it adds a level of appreciation to every track. Without seeing the movie,Â it may seem a bit odd when Edith Piaf’s voice cuts in towards the end of “Waiting For A Train” with a few notes from “Non Je Ne Regrette Rien” (“I Regret Nothing At All”), but after the experience of the film, it’s a beautiful addition. 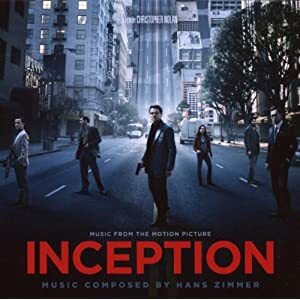 1 user commented in " Music Review: Music From the Motion Picture Inception, by Hans Zimmer "
“Time” is the most intriguing composition of all and overall theme in my opinion. The piece is as brilliant as the composer himself.